The Lecce Italian Language Experience: Last call for the September 2015 Lecce Italian Language Experience but the time to act is now. 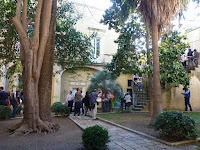 Last call for the September 2015 Lecce Italian Language Experience but the time to act is now. Learn the beautiful Italian language in September in Lecce in southern Italy - great weather, warm friendly people, stunning food - an opportunity too good to pass up - so what are you waiting for? Prices start from $AUD6100* twin share. Open this link for all the details - The September 2015 Lecce Italian Language Experience. To tempt you some more, Italian film maker Peppino Ciraci has produced a series of short videos on the beautiful Salento region of southern Italy. Click on the following link and enjoy. While you are it why not check out the Lecce Italian Language Experience Facebook page for stories and pictures from the May 2015 tour. Emozione Salento - a video exploration of the heel of Italy by Peppino Ciraci. *Quoted price of from $AUD6100 includes airfares, tuition costs and accommodation. See link for details. Flights are with Emirates Airlines, Malaysian Airlines, or Etihad Airlines. Prices are ex-Australia and in Australian dollars. International enquiries welcome. Price will be adjusted according to your location and your currency.